The Egg or Melon Basket is one of the favorites among customers for gift giving and for keeping. Baskets available with 4, 6, 10 and 18-20 inch hoops. 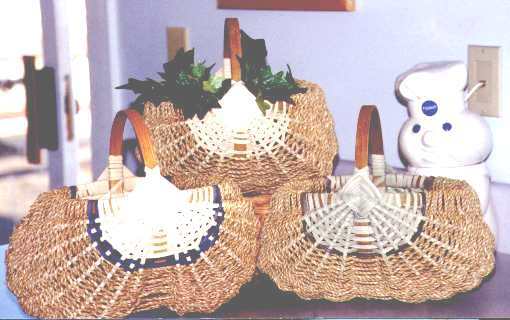 Baskets are several inches larger than hoop size. Melon Baskets have more of a rounded bottom (melon shaped) and Egg Baskets have two cheeks. Egg Baskets were traditionally made to have the two sections to more evenly distribute the weight of the eggs. Jelly Baskets, Tulip Baskets, and Gift Bag Baskets are the second most favored gift giving baskets. Jelly Baskets are made to hold two pint size jars of your homemade goodies such as jellies, jams, pickles, etc. Tulip Baskets are woven with hand pounded ash strips to resemble tulips. Both baskets come with a wire handle. Gift Bag baskets have a fold in the side to resemble a paper bag and have seagrass handles. Bread Baskets make wonderful gifts for that bread maker in your life. Shaker Cathead Basket (woven with four points at the bottom resembling a cat's head with ears when looked at upside down) is a lovely traditional gift basket just right for that country or antique home. Swing Handle Market Baskets and Holiday Bread baskets make any gift giving occasion special. In the center is a nice traditional Continuous Weave Floor Basket. On the right is a beautiful popular basket (most customers buy to this one to keep) called the Round Curl Basket with hand pounded ash curls.